Kent Police were this afternoon formally congratulated on the outstanding success of Operation Ploughmans. Speaking from outside Downing St, Prime Minister David Cameron praised the two month operation as ‘a significant contribution’ to Britain’s home economic security. From their operations base at Dover, police officers intercepted several tankers of Spanish olive oil, along with sizable quantities of Macedonian pine nuts. Maps in the trucks confirmed police suspicions that the raw materials were destined for industrial warehouses in the so-called ‘Kitchen Garden’ of Surrey. Here they would be mixed with locally grown basil and parmesan cheese which was to be flown over from Italy this weekend. Police admit to being overwhelmed by the scale of what they had uncovered, and the disciplined approach of those involved. In the words of one senior officer, ‘It was like they were following a recipe or something’. 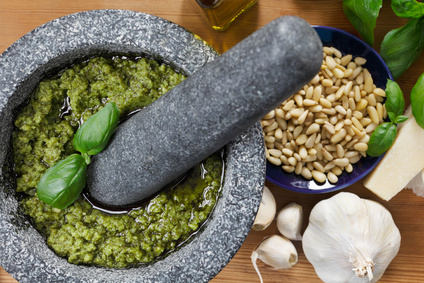 Police have long been aware of small scale pesto use among students and the ‘hippie’ community, but tended to take a lenient approach if it was ‘for personal use’. And while television cooks like Jamie Oliver, have done much to glamorize a garlic-fuelled lifestyle, at the same time travel shows often warn of how European Tapas bars can lead to a sense of paranoia and confusion among bewildered English tourists, as they try to find a familiar midday dish of flavourless cheese and crusty scrapings of Branston pickle on overpriced slices of yesterday’s bread. You might also enjoy this older NewsBiscuit post on judges and juries (though it’s not very polite about juries…! ).